In the red city of Marrakesh, step back in time as you wander through the Jemaa-el-Fna, a square and exotic bizarre offering some of the greatest open-air entertainment. Listen to the storytellers-an integral part of the culture-and browse for handicrafts. In Fez, take an optional tour to see the ancient medina. Founded in the 9th century, it is one of the largest medieval cities in the world and now a UNESCO World Heritage Site. 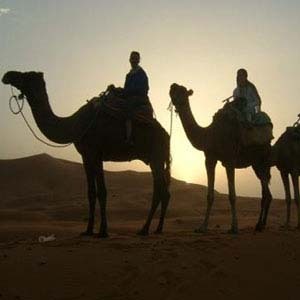 On this comprehensive and affordable tour of Morocco, you will also be enchanted by beautiful landscapes, stunned by the beauty of the desert, and surprised by the mountain scenery of the Middle Atlas. You’ll also visit Casablanca and its newly built great Mosque; Meknes, where you’ll visit the royal stables built to house 12,000 of the royal horses. Your tour also takes you to Ouarzazate, where you’ll visit the Kasbah de Taourirt, built in the early 19th century and used as a base for the powerful el Glaoui tribe, who controlled the caravan route through the region. See the mountain resort of Ifrane; Erfoud, the gateway to the Sahara desert; and Rabat, Morocco’s vibrant capital where you’ll visit the relics of Chellah, a city built by the Romans in 40 AD. Erfoud is an ancient city on the edge of the Sahara desert in Morocco,Africa. can be summed up in one word: relaxing. The forts of the old city are a blend of Portuguese, French and Berber military architecture, and their massiveness lends a powerful mystique to the town. The Skala du Port, designed to protect the town’s sea, has good views and was also where Orson Welles shot some of his film Othello. A series of gates surrounds the two centres of ancient, medieval Fez. The principal axes link the centre to the gates and a street surrounds the heart of the old city. The Kairouan quarter, which is longer, is crossed by an artery. Narrow, tortuous pedestrian streets, covered passages, stairs and numerous dead-ends make up the dense layout with few urban squares. One can still see the religious and military monument reflecting the heyday of the Moorish city, and the intellectural enlightenment of the Islamic city. The twin cities have not lost their individual characters. Located in west central Morocco at the foot of the Atlas mountains, it is a popular resort area and known for its leatherworks. today. At 1,160 m altitude, Ouarzazate is a settlement of some twenty thousand inhabitants and offers all the amenities of a modern city. The town is proud of the great Somal mosque, the first stone of which was laid by King Mohammed V in 1958. Large luxury hotels welcome the many tourists who come to discover the exotic beauty of southern Morocco and life in the “pearl of the sands”, as “Ouarzazate” is known.